O.Stumper et al. Heart 2003;89:1227-30. Technique: 3-4 mm diameter loop is created using temporary epicardial pacing wires as follows: The needle ends are removed. 5 cm of the wire tips are bared of its insulation. The 2 bare wire ends are tied in a loop. This provides ~90 cm long wire. 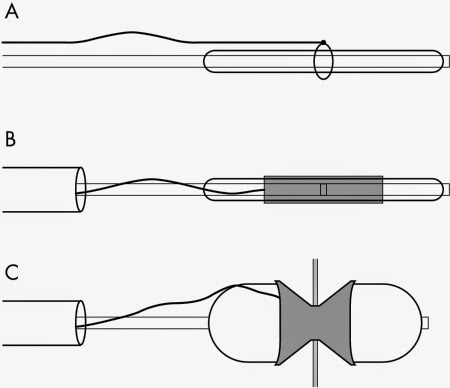 A secure double-knot over a 10-14 French dilator. The loop is paced over a 15-25 mm Valvuloplasty balloon (?low pressure). J&J P308 or P188/JoMed 17 mm stents are options. 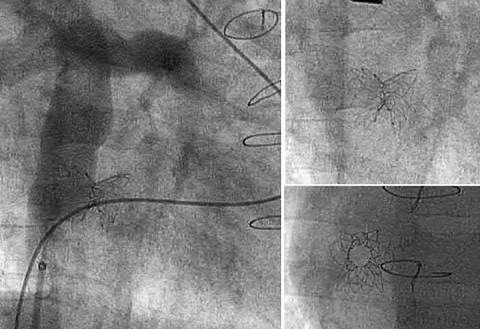 The stent is gently dilated using 10-14 French dilator and then, mounted on the balloon - keeping the knotted-loop over the center of balloon. Deliver using 11-14 Fr Mullin sheath.